My Grandma B had two walnuts trees at her house. When I was little, I remember climbing those trees. It was one of the few trees that I had guts enough climb. I felt like I was being extremely adventurous when in reality I was at most 5′ off the ground. As I got older, instead of climbing the walnut trees, I remember gathering the nuts and shelling pounds of them for my grandparents. While I may have some fond memories of walnuts, I have to say, I’m definitely not a fan of raw walnuts. My brother-in-law’s sister describes the taste best in comparing it to earwax. Sorry if I ruined raw walnuts for any of you. Toasted walnuts, on the other hand, are quite delicious. Combine it with orange and you have a winning combination. Adding some cardamom, takes it a notch higher. 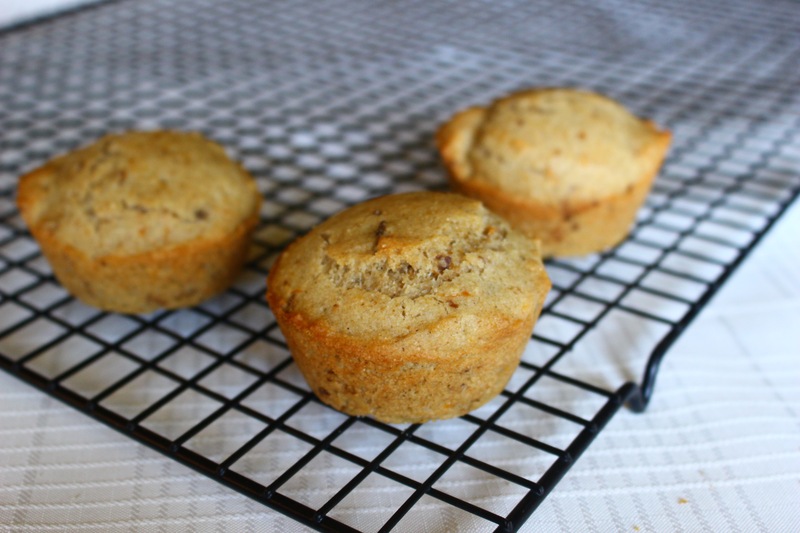 With these muffins, there are 3 options for topping the muffins, and each option is delicious: option one is plain; option two is a sugar topping; and option three is a glaze. Preheat oven to 375˚ and spray a muffin tin with cooking spray. In a large bowl whisk together first 9 ingredients (the sorghum flour through the cardamom). Set aside. In a medium bowl, rub the 3/4 cup of sugar with the 2 teaspoons of orange zest until the sugar begins to turn orange. This really helps infuse the flavor of orange throughout. Using an electric mixer, beat the coconut oil and orange-sugar together. Add applesauce mixture, and cultured coconut; mix until combined. Pour over dry ingredients and mix until combined. Stir in toasted walnuts. Portion batter into prepared muffin tin, filling them about 3/4 full. 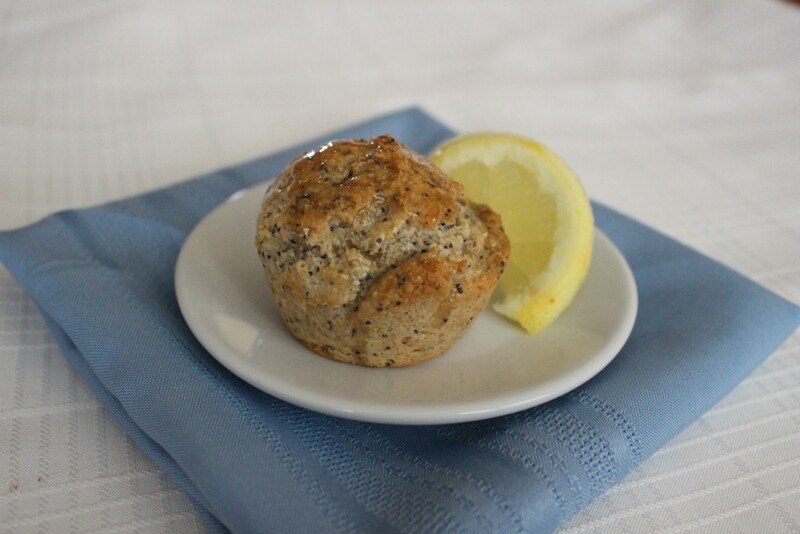 If using the optional sugar topping, sprinkle about a teaspoon of the sugar on top of each muffin. Bake in preheated oven until golden brown, about 25 minutes. Cool in pan for 5 minutes before removing to a cooling rack. If using glaze, spoon over muffins while muffins are still warm. Rub together 2/3 cup sugar and 1/2 teaspoon orange zest until the sugar begins to turn orange. Mix together all glaze ingredients (powdered sugar, orange zest, and orange juice) until it forms a smooth glaze. You can also freeze the muffins, unbaked. Portion in pan and freeze, then you can remove from the pan and freeze in a bag. When ready to bake, place the frozen batter into a greased muffin tin and bake for 35-40 minutes. 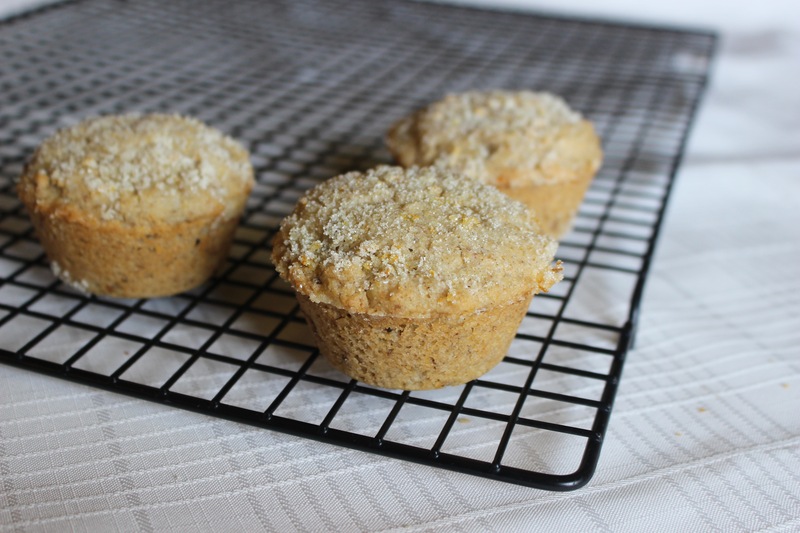 The thing that I like about these muffins is that they are not overly sweet which makes for a great snack. Consequently, I decided to enter this sweet snack in the So Delicious and Go Dairy Free Snackable Recipe Contest. One flavor that I love is lemon…as long as it is natural. No artificial lemon flavor for me. 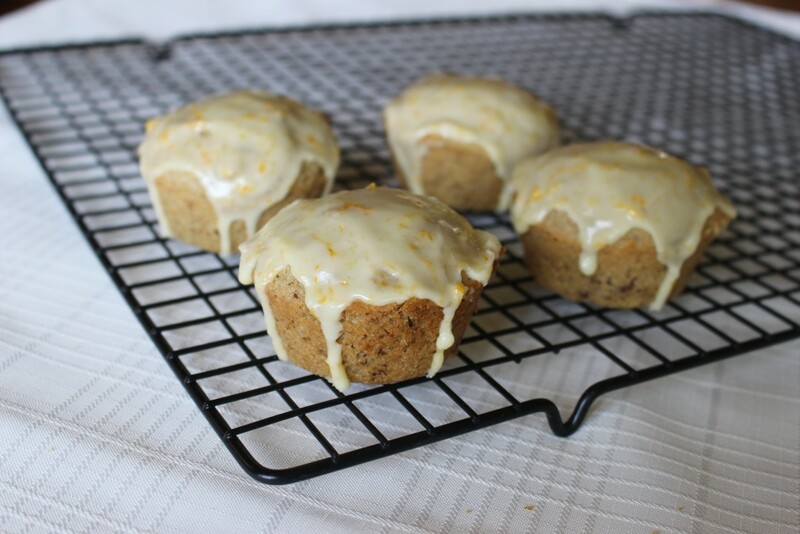 These muffins have great natural lemon flavor and tartness. They are also not too sweet to have in the morning or for a snack, and they are easy to throw together (especially if you do what I do and have the dry ingredients mixed together in ziplock bag in the freezer). They freeze well, and the lemon syrup that is brushed on top gives them a nice zing to wake you up in the morning. Preheat oven to 375˚.In a large bowl, and spray a muffin tin with cooking spray. In a large bowl, whisk together flours, starches, psyllium, baking powder, baking soda, salt, poppy seeds, and sugar (in other words, all ingredients up to the cultured coconut). In a small bowl whisk together cultured coconut, applesauce mixture, and lemon zest. Add yogurt mixture to dry ingredients. Stir in melted coconut oil. Using a greased 1/3-cup measuring cup (or a large 1/3-cup cookie scoop which is what I prefer), portion out the batter into the muffin tins. Bake for 25-30 minutes, or until toothpick comes out clean and the tops start turning golden brown. 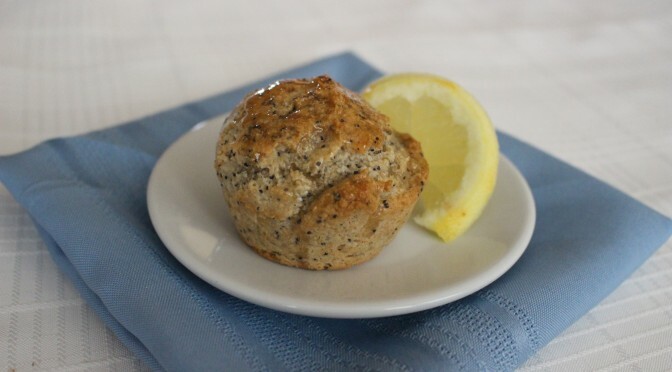 While muffins are cooking, stir together 1/4-cup of sugar and lemon juice. Heat over medium heat until slightly thickened, about 5 minutes. Now for one of the hardest parts of the recipe: let the muffins cool in pan for 5 minutes before flipping them out onto a cooling rack. 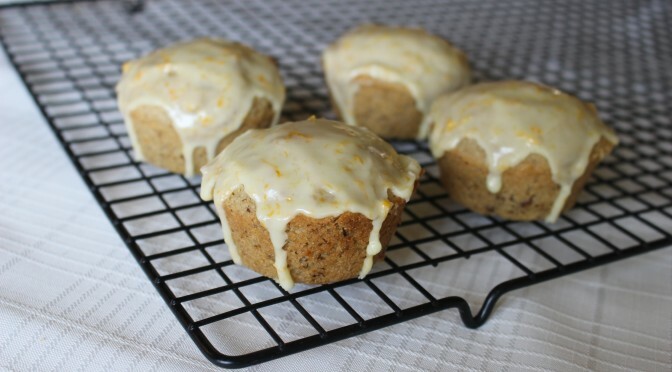 Brush muffins with lemon syrup and allow to cool for 10 minutes (the hardest part). Because of the ease of preparation and the balanced sweetness, these make a good snack. 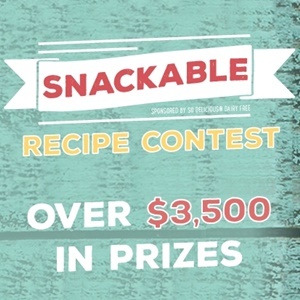 Consequently, I decided to also enter it in the So Delicious and Go Dairy Free Snackable Recipe Contest. Something that our garden is busting with this year is basil. It’s grown so fast that it lifts the fabric cover we have over it (to keep the bugs off). You can only freeze, dry, or pesto so much (yes, I used pesto as a verb) before you’re out of space and patience. 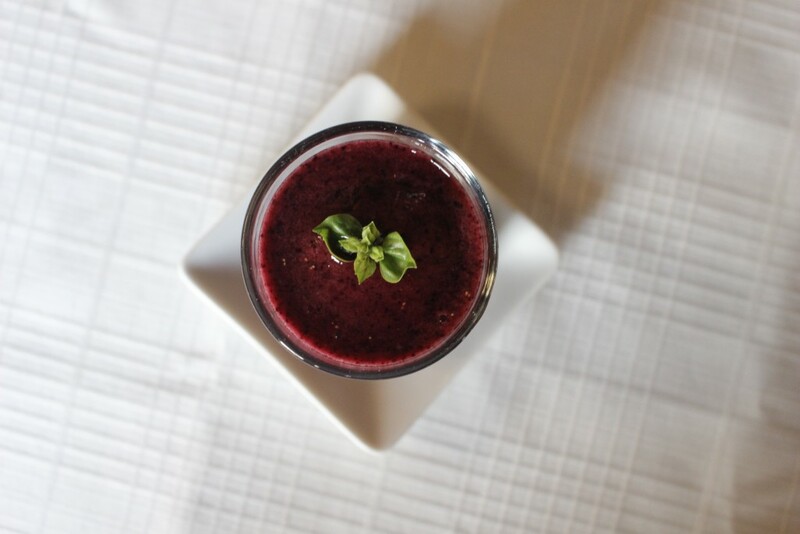 I wanted to come up with a sweet way to use the basil, and came up with this drink. Let me tell you, if you want a refreshing drink, look no further! 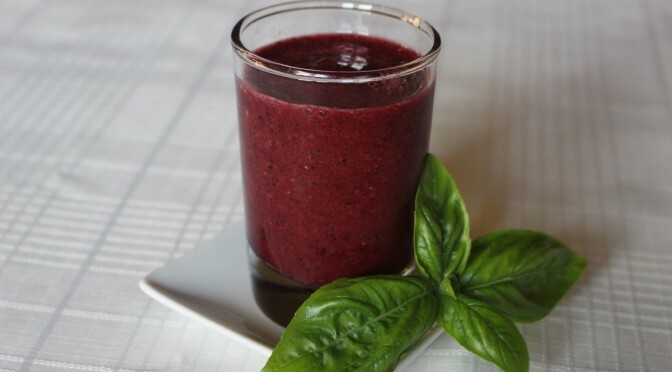 The basil offers such an interesting twist on the typical blueberry smoothie. Using frozen coconut milk instead of ice is another good trick as it keeps the smoothie creamy, not watery. In a medium bowl, place lemon slices, sugar, thawed blueberries, and half the basil. Using a potato masher, or the end of a wooden spoon, mash the mixture together until sugar is partially dissolved. Stir in lemon juice and water. Pour through strainer set over a blender. Add frozen blueberries, remaining basil and frozen coconut milk. Blend until smooth. Serve immediately. This simple sippable snack is so superb (ok, enough alliteration) I entered it in the So Delicious and Go Dairy Free Snackable Recipe Contest.